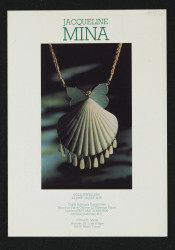 Photocopy of a three-page object price list made to accompany the Crafts Advisory Committee's exhibition 'Jacqueline Mina: Gold Jewellery' from 24 June to 19 July 1975 at the Crafts Advisory Committee Gallery, 12 Waterloo Place, London. The list is organised by case number and provides a short description of each work in the exhibition, production date and price (where available for sale). Stapled together in the top left corner, covered by a reference sticker and tape. A barcode sticker is attached to the reverse of the third page.